Go forth and toilet with confidence knowing that you are the master of the toilet kanji. Japanese toilets are world famous for turning what is usually a simple pull-lever process into a multi-button, multi-function technological maze. Although there are often many little helpful symbols to guide your toilet usage, there are plenty of toilets only in hiragana and kanji. So here is a guide to trouble-free toileting, which will hopefully spare you the embarrassment of failing to find the flush button, walking out the cubicle and having to smile apologetically at whoever is waiting outside. The first priority: find the toilet. You will need to look for お手洗 (てあら)い or トイレ. The second priority: walk in to the correct toilet. 3) jump out of your skin as the toilet automatically lifts its lid as if eager to devour you. Now you are ready to sit on the toilet seat 便座 (べんざ). 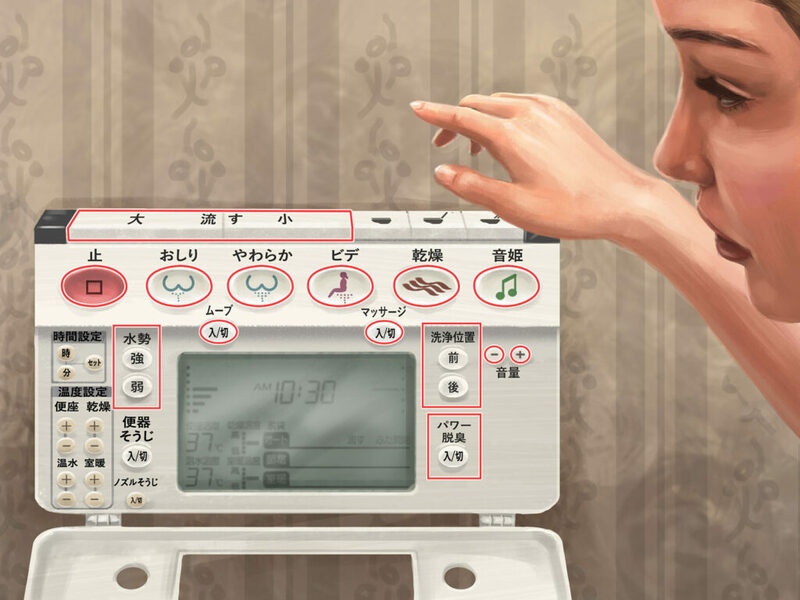 But, before you start pressing any buttons you might want to locate the flush button – 流 (なが)す. This is often just marked with 大 (big) or 小 (small). I’m sure you can imagine what each of these ‘flush levels’ might be for. Secondly, and possibly even more importantly, locate the stop button. If you’ve read our Around Town Guide, you’ll be familiar with the kanji 止, which I affectionately term the ‘thou shalt not’ due to its use in prohibition signs. In the case of toilets, however, it does not instantly zap you with constipation, but will stop any special toilet function that you may have unwittingly activated. Whatever happens, do not panic at any unusual sensations and get off the toilet as this will result in flooding the floor. I may or may not speak from personal experience. You can alter the direction of the spray from forwards 前 (まえ) to backwards 後 (うし (ろ)) so be assured that you can be showered perfectly from most kinds of seating positions. Some shower toilets will have a dry function 乾燥 (かんそう). There may be various functions written in katana such as ムーブ and マッサージ. These may be controlled by separate 入 (On) and 切 (Off) buttons or a combined switch 入切. Not only do Japanese toilets have your hygiene and comfort covered, but they’re great at providing some modesty too. To muffle any potentially embarrassing noises you should make – noises that the person in the next cubicle is also probably hoping that he/she won’t make – you can turn on a flushing sound. This is marked as 音姫 (おとひめ), which literally translates as ‘noise princess’. Now you can feel like royalty on the throne. Should the noise not be loud enough, you can adjust the volume 音量 (おんりょう) or, alternatively, you can shut it up completely – 音停止 (おとていし). For the ultimate modest experience, you can even make a pleasant smell by use of the POWER DEODORISER, which must be said in a SUPERHERO voice for the best effect: パワー脱臭 (だっしゅう). Now you can be the most hygienic, heroic royal around town, who can definitely locate the flush button and absolutely never jumps at automatic toilet seats. Go forth and toilet with confidence!